Most companies have computers grade their mock exams. This gives accurate scores, but not accurate feedback. If a student misses two triangle questions on an exam, a computer will report that the student is weak on triangles. But that student may have missed the triangle questions due to errors in algebra or arithmetic. Triangles may not be the problem at all. A grammar question with a misplaced modifier may have an answer that corrects the modifier but contains improper semi-colon use. A student who picks this answer will be tagged by a computer as needing to work on misplaced modifiers, even though what they really need is a review of semi-colons. Scoring by hand takes more time, but it shows where a student really needs help. It also tells us other key information: is the student writing down their work? Are they using test strategies? Are they fighting through difficult questions or just giving up? These questions can’t be answered by a computer, and they’re very important. Starting the tutoring process without a mock exam is like taking a road trip without a map: you may get where you want to go, but it will take a lot more time and effort and be a lot less pleasant. 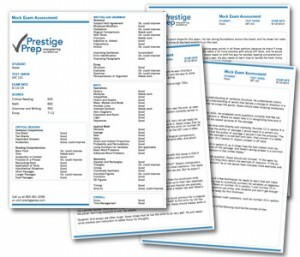 Prestige Prep offers mock exams in New York City for all the standardized tests we tutor. Price for our hand-scored mock exam and assessment is $150. Private mock exams available upon request.